When Brigham Young University professor, Brad Wilcox, gave his “His Grace is Sufficient” talk at BYU in 2011, Latter-day Saints were using his words to give the impression that Mormonism’s version of grace was not all that different from what most Christians believe. However, when one carefully listens to that speech while interpreting his words as an informed Mormon would understand them, it was readily apparent that Wilcox is not at all espousing a New Testament view of this precious doctrine. 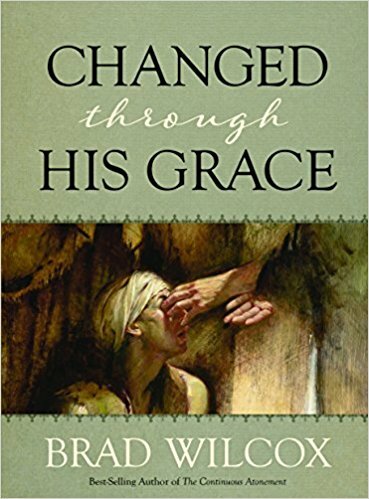 The same holds true for his new book titled Changed through His Grace (Deseret Book, 2017). Grace is not a handout, but a hand up. . . God is not enabling us to bypass His Laws but empowering us with an increased ability to live by His laws. Grace is the absence of God’s high expectations. It is the presence of His power—a portion of His unlimited capacity that allows us to join with Him and do together what we could never do alone. Let me say that within the context of sanctification, I would agree that grace enables believers to live a holy life that brings honor to the One who gave His life to save us. But is Wilcox wanting to give the impression that grace alone is needed for our justification? On this he can be confusing, but it appears he does not share what post-Reformation Christians believe on the subject. He shows his hand by using the straw-man logical fallacy by writing, “Perhaps the reason Latter-day Saints have been hesitant in the past to speak and teach about grace is that we never want to be seen as going to the same extreme as many other Christians when it comes to this doctrine” (13). In one sentence, repentance means turning from that which we have done wrong in the sight of the Lord and never repeating that mistake again (Ye Are the Light of the World: Selected Sermons and Writings of Harold B. Lee, 1974, 321). The forsaking of sin must be a permanent one. True repentance does not permit making the same mistake again…The Lord said: “Go your ways and sin no more; but unto that soul who sinneth shall the former sins return.” (D&C 82:7) (Repentance Brings Forgiveness, an unnumbered tract). Kimball also said if a transgressor exhibits “true repentance,” it “spreads to all areas of his life” (Teachings of Presidents of the Church: Spencer W. Kimball, 43). Has Wilcox’s accomplished this in his personal life? If not, his stereotype now becomes an accusation based in hypocrisy. I wish the reader to understand that as often as we mention Faith alone in this question, we are not thinking of a dead faith, which worketh not by love, but holding faith to be the only cause of justification. (Galatians 5:6; Romans 3:22.) It is therefore faith alone which justifies, and yet the faith which justifies is not alone (Acts of the Council of Trent with the Antidote, Canon 11). A Christian, being consecrated by his faith, does good works. But he is not by these works made a holier person, or more of a Christian. That is the effect of faith alone. No, unless he were previously a believer and a Christian, none of his works would have any value at all; they would really be impious and damnable sins (“On the Freedom of the Christian,” conclusion, paragraph 28). This salvation requires more than repentance and baptism by appropriate priesthood authority, It also requires the making of sacred covenants, including eternal marriage, in the temples of God, and faithfulness to those covenants by enduring to the end (166-167). Several LDS leaders who carry far more doctrinal authority than Wilcox would disagree. For example, on page 95 of the book Teachings of Lorenzo Snow, the fifth president said quite plainly, “We must work for our own exaltation.” Twelfth President Spencer W. Kimball concurred when he wrote, “And however powerful the saving grace of Christ, it brings exaltation to no man who does not comply with the works of the gospel” (The Miracle of Forgiveness, 207). Continuing his semantical distortions, Wilcox says, “Exaltation is not earned. It is inherited” (64). But in a 1988 general conference message titled “An Invitation to Exaltation,” 16th President Thomas S. Monson said, “It is the celestial glory which we seek. It is in the presence of God we desire to dwell. It is a forever family in which we want membership. Such blessings must be earned” (Ensign, May 1988, 56. Emphasis mine). James E. Faust, a member of the First Presidency, also emphasized the need to earn exaltation in a 2003 conference message titled “Dear Are the Sheep That Have Wandered.” He declared, “Repentant wayward children will enjoy salvation and all the blessings that go with it, but exaltation is much more. It must be fully earned (Ensign, May 2003, 62. Emphasis mine). When Joseph Smith made inspired changes to the Bible, he revised Romans 3:24, which said “justified freely by his grace” to instead say, “justified only by his grace” (italics in original). Smith indeed made this alteration, but what Wilcox fails to acknowledge is that Smith also changed Romans 4:16 to say we are “justified of faith and works,” thus undermining any point he was trying to make. Salvation by grace alone and without works, as it is taught in large segments of Christendom today, is akin to what Lucifer proposed in preexistence—that he would save all mankind and one soul should not be lost. He would save them without agency, without works, without any act on their part. As with the proposal of Lucifer in the preexistence to save all mankind, so with the doctrine of salvation by grace alone, without works, as it is taught in modern Christendom—both concepts are false. Christians should be cautioned before accepting the folklore that Wilcox is promoting. Works still play a huge role in a Mormon’s exaltation. Sadly, rather than clarify the LDS position, this book will only add to the confusion. For more on salvation, click here.